For me, this recipe falls under the category of "comfort food." There are no surprising flavors or textures, just warm, gooey, easy goodness. It's similar to chicken divan, but is made in a slow cooker. And I'll be honest, it really benefits from the sprinkling of cheddar cheese when serving. But I like that you get a protein, a veggie, some dairy, and a grain all in one dish. Simple! And it won't heat up your kitchen. Whisk together the soups, broth, onion, and garlic powder in a slow cooker. Add chicken and turn to coat. Cook on low for 6 hours or high for 3 hours. Shred the chicken and stir in the sour cream. Add salt and pepper to taste. Stir in broccoli florets and heat through. 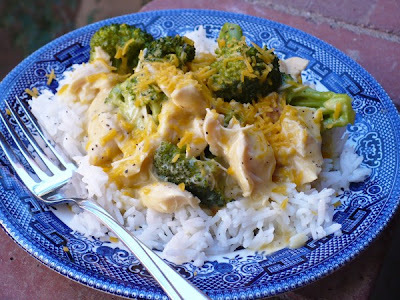 Serve over rice and sprinkle with cheese.